The Computer Skill Test (Part-II) for the post of UDC was held on 27.8.2017 and 24.9.2017 for different Regions. The Region-wise list of Qualified, Not Qualified and Absent candidates excluding Gujarat and Himachal Pradesh Region is appended with this Notice on the website of ESIC. The result of candidates finding place in Select List will be declared by the concerned Appointing Authority. The result of Computer Skill Test for Gujarat and Himachal Pradesh Region is not declared due to enforcement of Model Code of Conduct in these States and the result for these regions will be declared in due course. While utmost care has been taken in preparing and uploading the result, possibility of inadvertent / technical errors cannot be ruled out. The ESIC reserves the right to rectify the same later on. 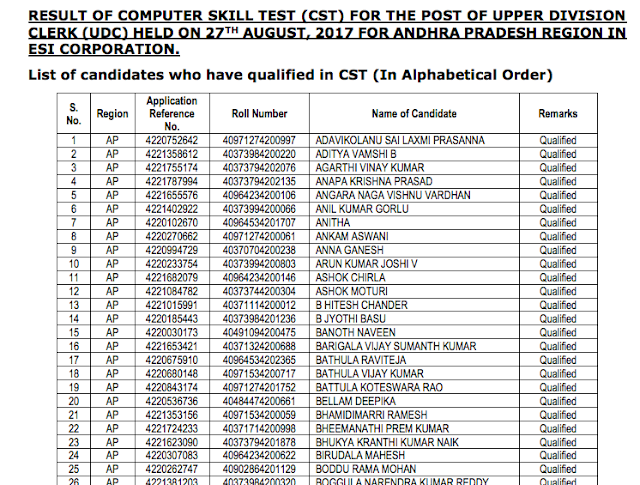 RESULT OF COMPUTER SKILL TEST (CST) FOR THE POST OF UPPER DIVISION CLERK (UDC) HELD ON 27TH AUGUST, 2017 FOR VARIOUS REGION IN ESI CORPORATION.